Are you ready for more American Ninja Warrior? USA Network has just released a new promo for the upcoming spin-off series, American Ninja Warrior: Ninja vs. Ninja. American Ninja Warrior: Ninja vs. Ninja premieres on USA Network this spring. Epic competition series American Ninja Warrior: Ninja vs. Ninja is bringing more heat to USA Network’s spring line-up, pitting three-person athletic teams against one another on physically demanding, side-by-side obstacle courses that test endurance and speed. Hosted by comedian Matt Iseman and former NFL player Akbar Gbajabiamila, the show will feature even more challenging obstacles than ever before – incorporating human agility, meticulous skill, and a whole new strategy of racing. For the 16-part season, fan-favorite competitors from the primetime “American Ninja Warrior” franchise will form 36 teams, each with two men and one woman, all competing to become the ultimate champions. In addition to hosts Iseman and Gbajabiamila, FOX Sports’ Alex Curry will serve as sideline reporter, rounding out the talent commentators. What do you think? 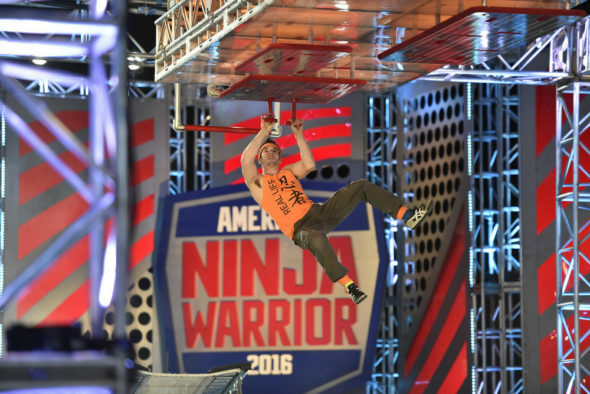 Are you a fan of American Ninja Warrior? Will you watch the new series? Wait, isn’t this basically just Team Ninja Warrior, but with a new name? Just with more teams and set at night? Don’t get me wrong, I love Ninja Warrior and will definitely be watching it, but it’s not really a “new” spinoff. I enjoy American Ninja Warrior and will surely check out this spin off.